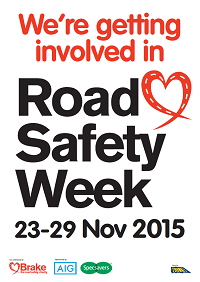 Welcome to your Road Safety Week 2015 action pack! Thank you for registering for Road Safety Week, 23-29 November, coordinated by Brake, with the support of the Department for Transport and sponsors Specsavers and AIG. 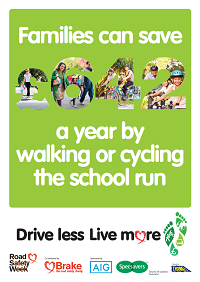 You are among thousands of communities, schools and organisations that have signed up for the UK's flagship road safety event, to help make roads safer and enable everyone to get around without fear or threat. 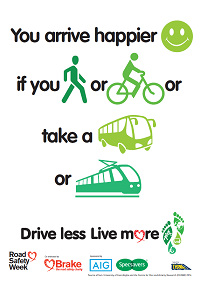 Our Road Safety Week 2015 theme is about making our streets safer and more pleasant by encouraging people to 'Drive less, live more'. 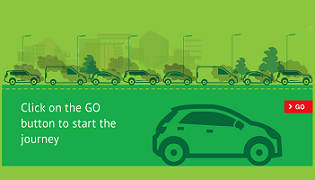 We'll be encouraging everyone to see if they can reduce car journeys by walking, cycling or using public transport instead. You can support this campaign using the resources below. Our guidance sheets (below) include ideas both on engaging with the theme and raising awareness about other road safety issues. You can also use our Pledge and fact pages, and get inspired by what others did in previous years. 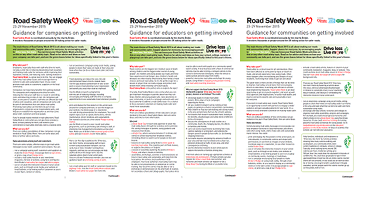 Whoever you are and however you're getting involved, make use of the downloadable posters and web banners below, see our new Drive less interactive resource here, and order Road Safety Week t-shirts and balloons and browse other resources in the Brake Shop. 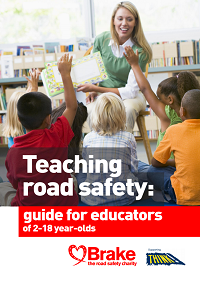 Find road safety lesson and teaching ideas for all ages in our online Teaching road safetyguide, or download a pdf copy. If you work with tots, sign up for a Beep Beep! Day and free resource pack. Encourage parents or young people to make Brake's Pledge online, or via our print-out form or email template. 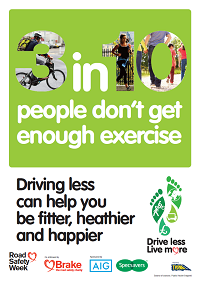 Distribute our new mini factsheet to promote the 'drive less, live more' message, or use it on your website or social media channels. 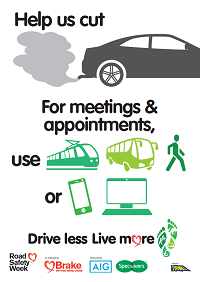 Use our new guidance sheet on running a car free day in your community. Use our guide on community campaigning to campaign for safer roads. 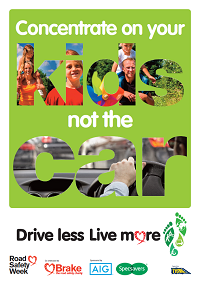 Use our new template press release to help you get road safety in the news. Tell us about your community campaign by filling in our form. 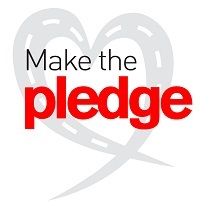 Encourage drivers, families or young people to make Brake's Pledge online, or via our print-out form or email template. 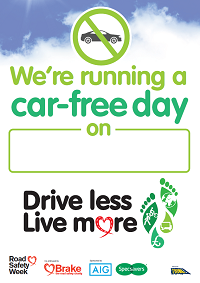 See our new guidance sheet on running a car free day in your workplace. 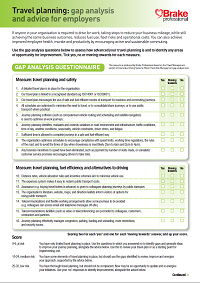 Use our new gap analysis questionnaire to help you reduce the cost, risk and environmental impact of work-related travel. 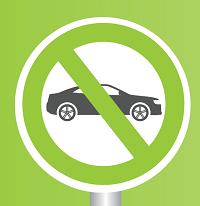 Read our guidance report Sustainable travel plans for employers. 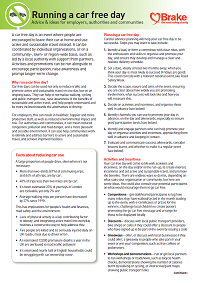 Encourage staff to make the Brake Pledge online, or via our print-out form or email template. 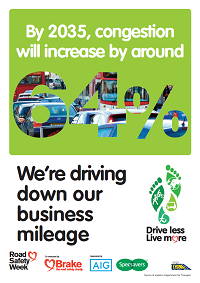 Attend a free Pledge webinar on delivering workshops to drivers. Use our free essential guide to fleet safety, and join brakepro.org for more. Sponsor a giant banner. We can arrange for display in a suitable location, and after the Week it's yours to keep. Many people fundraise for Brake in Road Safety Week. It's a great way to get people on board with road safety while supporting Brake. See the ideas below and on our website. Bright Days: A fun dress-down day in schools or workplaces, where everyone wears bright colourful clothes, raising awareness of road safety issues. Bake for Brake: Channel the Great British Bake Off spirit and bake for Brake. Ice your cakes with zebra stripes and promote the 'drive less, live more' message. Party for Brake: Run a karaoke/variety/quiz where you sell tickets and run a raffle. 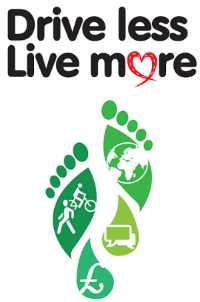 Walk, run or bike for Brake: Get sponsored to do a walk, run or bike-ride that promotes the benefits of driving less. 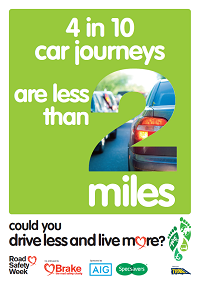 Run a 'drive less' competition: see who can travel the furthest on foot, bike or public transport in Road Safety Week, asking everyone to make a donation. If you're planning a fundraiser, fill in our form so we can help you make it a success. You can also set up a fundraising page for your Road Safety Week 2015 event, or make a donation, on Brake's Just Giving campaign page. 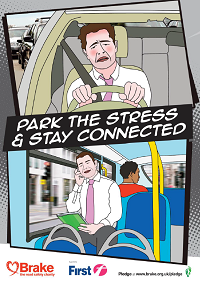 Below, you'll find links to Brake's brand new resources for Road Safety Week 2015, which you can use to promote the Week in your school, company or community. You'll also find a selection of posters that you can print and display on noticeboards and displays, or use online and in bulletins. Click the images below, then right-click the resource to save or print. More resources are available from the Brake Shop. 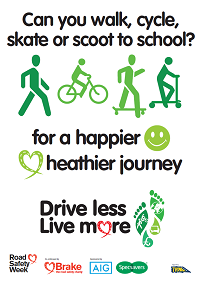 Good luck with your Road Safety Week! We’ll email you after to find out how it went. 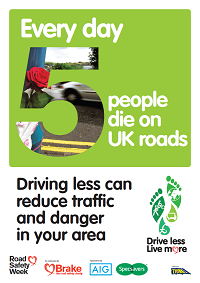 Keep us informed on Facebook or Twitter using #RoadSafetyWeek and #drivelesslivemore.